TuNur’s planned project in Tunisia hopes to tap into the Sahara desert’s vast potential to provide solar power. Its request to the Tunisian energy ministry envisages a facility in the southwest of the country that will produce 4.5GW of power. Chief Executive Kevin Sara claimed that an initial 250MW could be up and running, powering Europe via an interconnector with Malta, by 2020. It would mean an extra 1,000GWh of clean power a year being made available to the European grid. 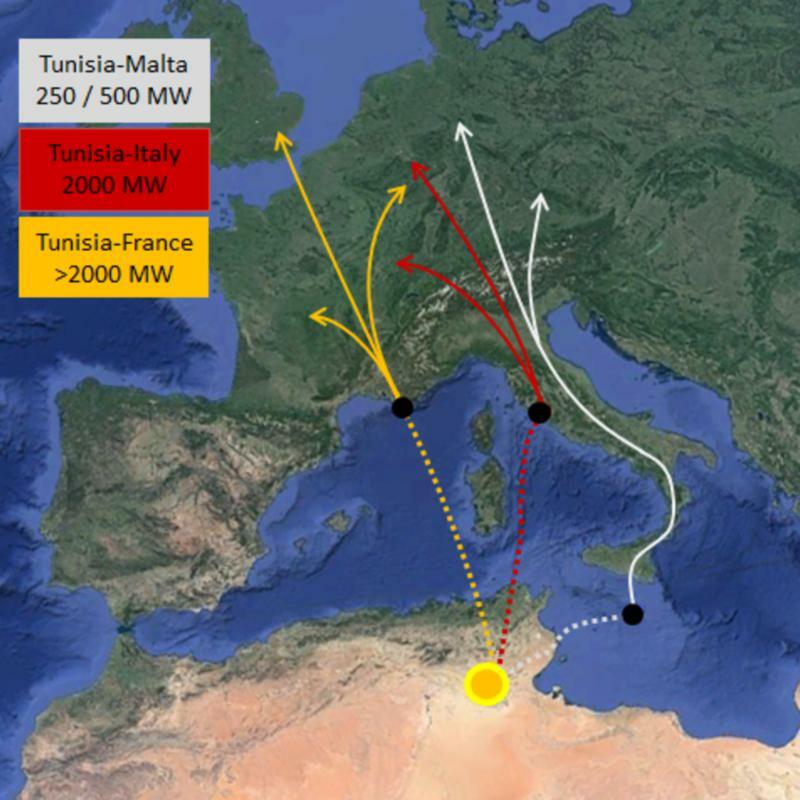 Italy and Malta’s energy grids are already connected via a 95km link that came online in 2015. Even this initial phase of development, which would cost an estimated €1.6bn, would be one of the largest facilities of its kind in the world. The TuNur project will hope to avoid the fate of the similarly ambitious DESERTEC initiative, which was scuppered in 2013 after its main backers fell out. The partnership began in 2009 with the aim of promoting a €400bn project that would have provided 15% of Europe’s power by 2050. Sara insisted that TuNur is better prepared for the challenges ahead, claiming that DESERTEC was “a big consortium of companies looking for business opportunities, but no plan”. Similar to DESERTEC, TuNur plans to exploit Tunisia’s abundant sunshine and large amount of land that is unsuitable for agriculture. The firm’s most ambitious version of its scheme is a solar facility that covers 25,000 hectares, an area nearly the size of Malta. The second stage of the plan is to construct Concentrated Solar Power (CSP) towers with a capacity of 2.25GW, which would be connected to Italy, just south of Rome, via another cable that would deliver 9,000GWh per year. This second 600km cable has been under development for a number of years and is currently being evaluated as a project of common interest by the EU. A third cable that will link Tunisia with France and more towers that would bring capacity up to 4.5GW are also planned. TuNur claimed in its request to the energy ministry that the power generated will be enough to power over 5 million homes or fuel over 7 million electric vehicles. Europe currently has about 100GW of solar photovoltaic power capacity, the bloc’s sixth largest source after natural gas, wind, coal, large hydro and nuclear. If TuNur’s plan to add 4.5GW of renewable energy to the mix comes to fruition, then Brussels’ renewable energy targets will be easier to achieve, especially if the initial phase of 250MW comes online by 2020, when the EU’s 20% renewable energy goal has its deadline. Although both DESERTEC and now TuNur have faced criticism and accusations of “colonisation”, the project insists that its planned facility will help prevent desertification and minimise water consumption. An impact study also predicts that 2,000 direct jobs and 20,000 indirect jobs could be created. CSP technology works by focusing the sun’s rays onto a central tower using a vast array mirrors. Molten salt is then used to store the energy. This article has been republished from Euractiv.com. The critical thing here is the cost ansselling price. SolarReserve is getting 6.3c/kh for a 24-hour plant in the northern Chilean desert, to serve mines. It is getting less, 6c/kwh, for a smaller plant with less storage in South Australia. That depends on a large cheap loan from Canberra. We can assume that with steady technical progress the TuNur plants will have a similar or lower selling price. That has to cover the cost of the cables. The price is above the average European wholesale price, and the feasibility depends on a premium price for despatchable capacity. In fact, it requires further growth in European renewables. Who is building the link from Tunisia to Malta, and is it actually “cheap”? I would think that with Tunisia’s growing demand for electricity, they’d want to use the output from the solar plant themselves. I would consider all North African countries politically too unsecure for the availability requirements of Europeen energy consumers. Such concentrated engery transfers of serveral GW per cable are a high risk thinking of the general risk of terror attacks. And if GB yields offshore wind power electricity for 40 Euro per MWh, Tunesias cost advantage is too low to pay for the long cable and additional transition equipment.